The first thing to say about this, the first Coffee Spot Guide, is that it’s not comprehensive, nor will any of these guides ever be. All that these pages attempt to do is give you a flavour of the town or city and list, in one place, all the Coffee Spots I’ve visited. There’s also a handy map. New York is one of my favourite American cities. I’ve been ten times now and, in that time, covered quite a lot of ground. However, saying I know New York or that I’ve “done” New York is as daft as saying I’ve done London. There are always places to discover, and old favourites to re-visit. Like London, it’s a massive, bustling, city, a place that I find wears me out if I’m not careful. It’s also a city of distinct neighbourhoods and areas. Although the subway is an efficient way of getting around and the water taxis offer amazing views, as much as possible I like to walk, taking in neighbourhoods as I go. In my time I’ve walked the length of Broadway from the tip of Manhattan to Central Park and I also like to head to Brooklyn across either the Manhattan or Brooklyn Bridge, returning on the other one. In terms of my Coffee Spot coverage, it’s patchy, with many of my visits to the city coming before I started the Coffee Spot. You’ll see on the map that I’ve concentrated mostly on the southern Manhattan area, particularly in the 20 blocks north of Chinatown, where I typically stay, although I’ve now also ventured over the river to Brooklyn as well. For more comprehensive coverage, the Best Coffee App now covers New York City, plus there’s an Editor’s Choice list, with 19 favourites on the website. If you’re looking for a different perspective, fellow blogger Bex has been to New York more often than I have. Check out her site, where there’s a handy list and map of all the places she’s visited over the years. Alternatively, if you prefer individual articles, try list of her ten favourite espresso bars (from 2013), and reports from 2012, 2014 and 2015. She’s particularly strong on the mid-town area where I haven’t really been and has recently branched out to Greenpoint (Brooklyn), the Financial District (Lower Manhattan) and revisited some of her old haunts in and around the East and West Villages. Header image: downtown Manhattan seen at dusk from the Manhattan Bridge with the Brooklyn Bridge in the foreground. 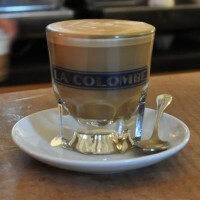 Near the southern end of New York City’s wonderful High Line and opposite Chelsea Market, this was famed Californian roasters, Blue Bottle Coffee’s first Manhattan coffee shop. However, despite its proximity to the High Line, this shouldn’t be confused with Blue Bottle’s High Line Café, which is just a block away on the High Line itself (it also has seasonal opening hours; being a partly outdoor location, it’s currently closed, reopening in April 2016). Back to the Chelsea branch, which isn’t far from fellow-roasters Intelligentsia and its coffee shop in the High Line Hotel. However, while that’s a very upmarket setting, Blue Bottle, situated in what was the loading dock of the Milk Building, is much more down-to-earth. Split over two levels with minimal seating, it still manages an impressive range of filter coffee to go with the usual espresso-based menu. You can sit downstairs at one of two window bars, or outside on the pavement on one of two matching benches. You can also sit upstairs, where there’s a second counter, unless it’s being used for training courses (usually Saturday afternoons). 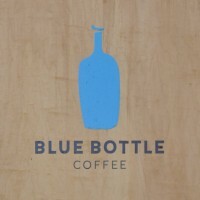 There’s also the famous Blue Bottle syphon bar up here from 11 until 2 on the weekends. February 2016: When I popped back into Blue Bottle to hand over its Best Cake Award from the 2015 Coffee Spot Awards, I learnt that the syphon bar is no more, although you can still sit upstairs if you wish. Since my last visit to America, I’ve been spending a lot of time at Beany Green in Paddington, where many flat whites have been consumed. So, after a week in America without a decent flat white (and, in general, without even a sniff of one), I finally had to admit defeat. So, one snowy Saturday morning, I headed downtown to very nearly the tip of Manhattan, to seek out Bluestone Lane, a self-professed Aussie coffee shop. The first task was to find Bluestone Lane, since while the address is 30 Broad Street, the actual entrance is on New Street, a narrow lane south of Wall Street, squeezed between Broad Street and the even broader Broadway. However, once you’ve found it and gone through the correct set of (three) doors, you find yourself in a little slice (with the emphasis on little) of Australian coffee heaven. There are flat whites and long blacks on the menu (plus bulk-brew for American sensibilities), with the likes of avocado on toast, banana bread and toast with vegemite, plus Lamingtons in the cake selection. The coffee’s all the way from San Francisco’s Sightglass, which I guess is at least on the way to Australia! April 2018: Bluestone Lane has now spread across America, with a series of coffee shops and brunch-style cafes, as well as roasting its own coffee. See what I made of the Rittenhouse Square cafe in Philadelphia when I visited last month. 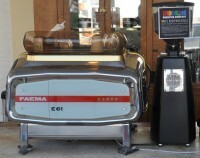 The subject of today’s Meet the Roaster is the Brooklyn Roasting Company. Tucked away on Jay Street, under the Manhattan Bridge, it was a highlight of my visit to Brooklyn back in March. Occupying the ground floor of a sprawling five-storey building, it’s an amazing place, which, as well as being a wonderful coffee shop, is also the Brooklyn Roasting Company’s headquarters, with all the roasting taking place on-site. So, as well as popping in for a great cup of coffee, you can also sit in the far corner watching the green beans being hoovered into the 35kg Loring roaster and enjoying the spectacle of freshly-roasted beans pouring out some 12 minutes later. Don’t worry about when to come if you want to catch the roaster in action; it’s pretty much a nonstop, all-day operation! Although the Brooklyn Roasting Company is a very modern affair, the building on Jay Street is steeped in coffee history. It used to be the stables of the famous Arbuckles’ coffee roastery, which was situated across Jay Street, the horses being used in the late 19th and early 20th centuries to haul the sacks of green beans from the ships docked at the nearby waterfront. I visited the Brooklyn Roasting Company on my first trip to Brooklyn in March 2015, calling in on the roastery/headquarters, under the shadow of the Manhattan Bridge on Jay Street. I hadn’t intended to visit another Brooklyn Roasting Company branch that day, but as I walked to Williamsburg, I went past the Flushing Avenue branch: it looked so amazing, I just had to go inside. Occupying a spot on the corner of Washington and Flushing Avenues since 2012, it’s essentially a large rectangle, with the long side on Flushing Avenue. Even though it’s north-facing, floor-to-ceiling, wall-to-wall windows on both sides, punctuated by glass doors, flood the interior with sunlight and present a visually-appealing vista from the outside. Rarely have I been so struck by a coffee shop’s external appearance. Inside it lives up to its promise, with an espresso-based menu served by twin Faema E61s, one at either end of the large counter, which takes up the middle half of the back wall. 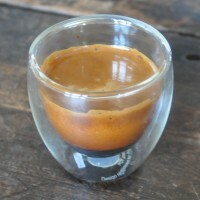 There are two options on espresso, plus decaf, and, of course, the obligatory bulk-brew. Having got your coffee, retire to one of the window-bars or, if, you can, grab a booth and watch the world go by. At the bottom of Jay Street, which runs alongside the Manhattan Bridge (my usual gateway into Brooklyn) the Brooklyn Roasting Company makes a great first stop when exploring the area (it’s also convenient for the York Street metro stop on the F line). Occupying the ground floor of a sprawling five-storey building, the Brooklyn Roasting Company is an amazing spot. Some coffee shops go to great lengths to achieve that stripped-back, industrial look; the Brooklyn Roasting Company simply moved into a 19th century stables down by the East River and, voila, there you have it. 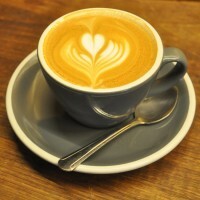 There’s a wide range of coffee on offer, with a standard espresso bar at one end of the building and a more experimental, speciality lab at the other, so all tastes should be catered for. As well as being a wonderful space to drink coffee, Jay Street is also headquarters of the Brooklyn Roasting Company, which means all the roasting gets done here. So, if that’s your sort of thing, you can sit in the far corner, by the lab, watching the green beans being hoovered into the 35kg Loring roaster and enjoying the spectacle of the freshly-roasted beans pouring out some 12 minutes later. 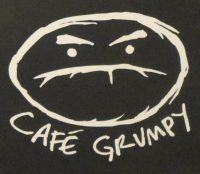 I was introduced to Café Grumpy by Bluestone Lane, who told me about their fellow Aussies when I visited the Bluestone’s Broad Street branch. Two days later I was looking for somewhere for lunch, so I sought out Café Grumpy’s Chelsea branch on New York’s W 20th Street. The first Café Grumpy opened in Brooklyn in 2005, while this is the second (of eight) branches of the bizarrely-named chain (I say this because, generally speaking, I find Aussies to be one of the most consistently upbeat of peoples, so to call your coffee shop chain “Café Grumpy” takes a certain sense of irony). Café Grumpy roasts all its own coffee in a dedicated roastery and has made its name with its pour-over coffee, which, in the land of the obligatory flask of bulk-brew, is still something of a novelty. If you like your espresso-based drinks, you’re also well-catered for, with the Heartbreaker blend being joined on the Synesso espresso machine by a single-origin (a Kenya Peaberry during my visit) and decaf (from Costa Rica). There are also four single-origins on the pour-over menu (a Guatemalan, a Mexican and two Kenyans), one of which is also available through the aforementioned bulk-brewer. Regular readers will know that I have a soft-spot for Brooklyn-based, Aussie-influenced roaster/coffee-shop chain, Café Grumpy. I first came across its Chelsea branch in 2015, before discovering that its Lower East Side branch is just around the corner from my hotel on my return in 2016. On that trip, I also discovered one of Café Grumpy’s more recent branches, right in the heart of New York City in the Fashion District. This has all the hallmarks of Café Grumpy, including its trademark no laptop policy. While you can argue with the merits or otherwise of this, Café Grumpy’s very upfront about this. The coffee offering’s the same across all branches: house-blend, single-origin and decaf on espresso, five single-origins (including a decaf) on pour-over and two more on bulk-brew. It’s also worth remembering that while now it seems that everyone on the East Coast’s offering pour-over, Café Grumpy was doing it long before it was trendy. In terms of layout, the Fashion District branch takes the no laptop philosophy to its logical conclusion. The seating consists of two large, communal tables, plus a bench at the back. While you can sit quietly by yourself, it really is designed to promote communication! Café Grumpy has become my favourite New York City coffee shop/roastery chain, particularly since I discovered the Lower East Side branch a few minutes’ walk from my usual hotel. 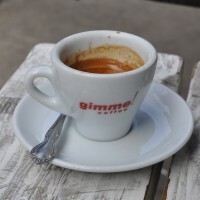 So I was delighted when I met up with Simon and Gemma, fellow coffee aficionados who I know from Instagram, and they told me about a new branch of Café Grumpy, conveniently located just around the corner from their hotel in Little Italy. Located on Mott Street, Café Grumpy opened in the early summer, 2016, several months after my last visit to New York, so I didn’t feel too bad about not having known about it. It’s in an area already rich with coffee, just a couple of blocks down from another favourite, Gimme! Coffee, around the corner from old friends, Caffé Roma, and one street from the lovely Café Integral. In keeping with the Café Grumpy philosophy, all the branches, no matter how large or small, carry the same full coffee offering, with the house-blend, Heartbreaker, joined by a single-origin and decaf on espresso, while on pour-over, there are multiple single-origins, plus decaf, supplemented by bulk-brew for those in a hurry. There’s also a range of tea, plus a selection of cakes and pastries if you’re hungry. I first came across Café Integral when I was last in New York two years ago. Back then, Café Integral was a small, but delightful coffee bar inside the American Two Shot clothing store. Not long after my visit, in August 2016, Café Integral opened its own coffee shop a couple of blocks away on Elizabeth Street, the subject of today’s Coffee Spot. This was part of an expansion that has also seen Café Integral open in Chicago, Miami and Los Angeles, all in collaboration with Freehand Hotels. 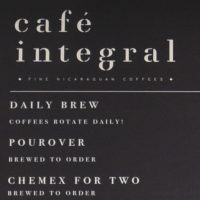 Cafe Integral’s main claim to fame is that it only serves coffee from Nicaragua, all of which is roasted in-house in Williamsburg, the coffee sourced from several farms in the country which have close ties to the Vega family, which owns Café Integral. There’s always an espresso blend (Dulcinea), plus a different single-origin on espresso, bulk-brew and pour-over. There’s also cold brew, nitro cold brew and a house tonic, plus tea for those who are so inclined. 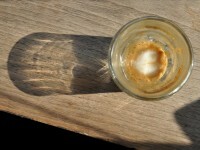 The coffee is all seasonal, changing every month or two, with the number of different options depending on the season. Meanwhile, if you’re hungry, there’s an extensive, and very tempting, array of cakes and pastries. I’ve been visiting Caffe Reggio, a Greenwich Village institution, for years, almost as long as I’ve been coming to New York City. Like Boston’s Caffé Vittoria and Little Italy’s Caffé Roma, it’s the sort of old fashioned, American-Italian café that I can’t help but fall in love with (although I also have a soft spot for the Anglo-Italian variety). Established in 1927, Caffe Reggio been going strong ever since, trading partly on its heritage, although there’s a lot more behind its success than just nostalgia. In terms of its coffee, it’s not going to win any third-wave aficionados over, but it serves a decent espresso, while there is an excellent range of cakes, which I’ve sampled before. Like many cafés of its ilk, there’s also a full food menu, which, due to illness, I didn’t get to try on this visit. It’s a fairly small, busy space, with a sumptuously-appointed interior, which is half the attraction. You can also sit outside at a row of tables on the sidewalk. Full table service is an added bonus. It’s fair to say that while I enjoy the coffee, the main purpose of my (continued) visits is to soak up the atmosphere. Last week, I promised you something different for this week’s Saturday Supplement. After weeks of reports from The London Coffee Festival, with the odd interlude for the Coffee Stops Awards and Caffé Culture Show, today’s Saturday Supplement is one for those of you with a sweet tooth. It’s also something of a new venture for the Coffee Spot, to go with recent posts on Tea Houses & Chocolate Shops. 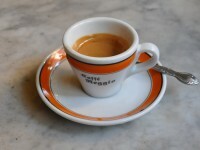 Last year, I wrote about Caffé Roma, an old favourite of mine in the heart of New York City’s Little Italy. An old-fashioned Italian café, Caffé Roma is renowned for its excellent cakes, one of which is the St Joseph’s Cake. These are only made at weekends during February and March. Using a deep-fried dough, they can be had plain or filled with either cannoli or vanilla patisserie cream. After publishing my original piece on Caffé Roma, I entered into e-mail correspondence with Vincent Jnr, whose father owns Caffé Roma. Knowing that I was back in New York, Vincent invited me over to say hello and, when I arrived, offered me the chance to have a tour of the bakery where the St Joseph’s Cakes are made. How could I refuse? Everyman Espresso is a chain of precisely two (now three) coffee shops in New York City, the original in the East Village, this one on West Broadway in Soho and a third in Brooklyn. I visited the Soho branch largely because it was more convenient, given where I was staying, plus it was the one that several baristas in other coffee shops had recommended. There’s no obvious menu in Everyman, something I first came across in La Colombe, a neat tactic which means you have to engage with the baristas. Unlike La Colombe, however, there is a printed menu; it’s just kept under the counter so you have to ask for it if you need it. New York City’s Gasoline Alley is a curious place. It could easily BE an alley, providing a cut across between Lafayette and Mulberry streets, on which some enterprising soul has put doors at either end and a roof on top to turn it into a coffee shop. Disappointingly, it’s not, but the feeling that you are sitting in an alley is hard to shake. 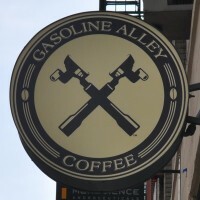 What made Gasoline Alley for me was the coffee; it serves Intelligentsia, a brand which I’m familiar with from my many visits to Chicago and one which I really like. Of course, great beans don’t guarantee great coffee, but in Gasoline Alley’s case, the baristas use their La Marzocco espresso machine to get the very best out of Intelligentsia’s Black Cat seasonal espresso blend. Gasoline Alley is part of the growing trend of coffee shops with strong links to cycling. It proudly announces this with a racing bike hanging above the counter and, as if to confirm the link, the Arc Racing Team stopped by for coffee while I was there, adding a certain frisson of excitement! There's also a second branch of Gasoline Alley further down on Lafayette on the corner with Grand which opened in 2014. I first discovered New York City's Gasoline Alley in 2013, when I visited the original branch on Lafayette Street. This, the second branch, which opened in 2014, is just around the corner from one of my regular breakfast spots, the Landmark Coffee Shop (a very typical American diner). The original Gasoline Alley could actually be an alley and, while the same is true of this one with doors at either end, it’s more corridor than alley. Considerably smaller than the original, there’s space for two bar chairs at its solitary window-bar, with a pair of benches outside, one for each window. I much prefer the atmosphere in this Gasoline Alley. However, where it wins hands down, just like the original, is that it serves Intelligentsia coffee and serves it extremely well. 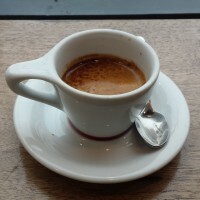 In fact, it might have served me the best shot of Intelligentsia’s seasonal Black Cat espresso blend that I’ve ever had! Gimme! Coffee is both a roaster and a regional coffee shop chain with four branches in upstate New York, two in Brooklyn and the solitary branch in Manhattan on Mott Street. It’s been around since 2000, while the Manhattan outlet opened in 2008, making Gimme! Coffee a comparatively long-established player in the New York coffee scene (unless you compare it to somewhere like Caffé Roma!). The Manhattan branch is essentially a takeaway place, although I got lucky with the weather and had a chance to sit outside while savouring my espresso. At a pinch, you could stand inside and drink your coffee, but when I tried that (while chatting to the staff) I found that I was constantly getting in the way of other customers. For somewhere so small, Gimme! Coffee packs a lot in though, including bags of charm and character. As a result, instead of just being somewhere to grab a coffee to go, it’s established itself as a real asset to the neighbourhood. It’s the sort of place I’d make a point of going to if I lived in the area, even if it was only for a couple of minutes a day. I discovered Gimme! Coffee on my first Coffee Spot visit to New York in 2013, when I visited the Mott Street branch in Manhattan. However, it took me another three years before I explored Gimme! Coffee’s Brooklyn heritage, when I visited Roebling Street in Williamsburg. Ironically, this is the newest of three New York City branches, having only opened in 2011, while the first (and other) Brooklyn branch has been around since 2003, the company itself starting in upstate New York in 2000. Roebling Street has a simple, rectangular layout, with the door at the right, the counter at the back and a smattering of tables in the space between the two. Resisting the urge to cram too much in, it’s a quiet, friendly spot with a sense of space. There’s also some outdoor seating on the (relatively) quiet street. Gimme! Coffee roasts all its own beans with a house-blend (Leftist), single-origin guest (Colombian) and decaf (another single-origin Colombian) on espresso. These are joined by two more single-origins on bulk-brew and third as a pour-over using the Kalita Wave. There’s also a range of teas from Metolius in Oregon and a selection of cakes and pastries if you are hungry. 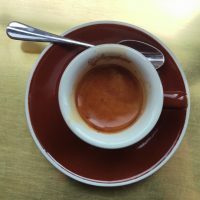 Ninth Street Espresso has been around since 2001, making it something of an established player in New York’s speciality coffee market compared to newcomers such as Pushcart Coffee where I’d started my day. I tried two branches, the original on 9th Street in Alphabet City and the East Village branch just two blocks away on 10th Street/Tompkins Square. In theory I should have liked Tompkins Square as much as I liked 9th Street. However, I didn’t. On such small things hang the status of a Coffee Spot, although in fairness to Tompkins Square, the reasons I didn’t get on with it were very much specific to that visit. 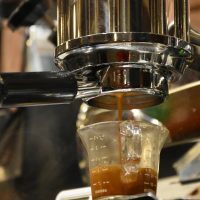 In both branches, the focus is firmly on the coffee, which is excellent, while what’s on offer is very typical for an American coffee shop. Although Tompkins Square has seating, it’s set up more for takeaway trade, while 9th Street is much more the place to linger for an hour or two. They’re a little off the beaten (tourist) track in the East Village/Alphabet City area, but if you happen to be in the vicinity, both branches are worth visiting. This time last year, the Coffee Spot made its first tentative steps into Brooklyn and the first place I published was the then Daily Press on Havemeyer Street, an oasis of calm at the foot of the Williamsburg Bridge. I was therefore rather distressed to discover later that year that it seemed to have disappeared, both from the map (well, Google Maps) and from social media. I asked around, but didn’t find out very much, so on my return last month, I was determined to track it down and see what had happened for myself. It was with some trepidation that I walked along Havemeyer Street, but I needn’t have worried. There was what I knew as Daily Press, in the same old spot, looking remarkably similar to how it had a year before. The name had changed, to Northerly Coffee, but stepping inside, everything looked very familiarly, right down to the sleek La Marzocco Strada on the counter at the back. It was the same warm, welcoming oasis of calm that I remember. There have been changes, however, and I was fortunate enough to run into Matt, the owner, who, over coffee, filled me in on the full story. I first discovered Parlor Coffee in 2016 via a combination of serendipity, a tip-off and keeping my eyes open. Back then, as well as being a roaster, Parlor Coffee ran a small coffee bar in the back room of the Persons of Interest barbershop in Brooklyn, which I spotted as I walked past one day. It was a lovely place, pulling some awesome espresso on a single-group Kees van der Westen, so I was rather upset to learn that it had closed last year. However, I recalled the barista, Vanessa, telling me that the roastery, also in Brooklyn, was open at the weekends, so when I found myself in New York on a rainy Sunday afternoon, I made a beeline for Vanderbilt Avenue. You’ll find the roastery here (which will have its own Meet the Roaster feature in due course) along with the subject of today’s Saturday Short, the Tasting Room. Stumptown, just off the lobby of Ace Hotel in New York City, is one of NYC’s most popular coffee venues, the queues frequently extending into (and around) the lobby. I first visited in 2013, meeting up with Greg of CoffeeGuru App, but it was another three years before I returned on a “quiet” day to do a write-up. As a coffee shop, there’s not a lot to it, although, like most Stumptown places, it’s sumptuously-appointed. In this case, a single bar runs along the window at the front, the counter running parallel to it at the back, with just enough space between them for customers to queue/wait to collect their coffee. Alternatively, you can sit in the atmospheric lobby of the Ace Hotel itself (if you can find a seat, that is). Stumptown’s Hairbender blend is on espresso, and a single-origin on bulk-brew, with both cold-brew and nitro on draft. Stumptown is, in US coffee circles (and beyond), something of a legend, both as a roaster and as the owner of some iconic coffee shops. On this year’s US trip, I thought it was high time I paid a visit. 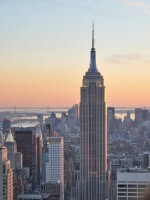 With branches in its home town of Portland (Oregon, not Maine), Seattle and Los Angeles on the West Coast, but just New York City on the east, the logical choice was NYC. I made a beeline for Stumptown’s second NYC location on West 8th Street, just north of Washington Square in Greenwich Village. Open since May 2013, it possesses quite possibly the most handsome interior of any coffee shop I’ve ever seen (although Intelligentsia in the lobby of the High Line Hotel gives it a run for its money). It consists of two connected spaces: a lavishly fitted-out espresso bar on the corner of West 8th and MacDougal Streets and a smaller, more intimate brew bar, with its own door onto MacDougal Street. The coffee, as one might expect, is all from Stumptown, with a quite bewildering array of eleven single-origin beans available, along with three blends and two decaf options (one blend and one single-origin). As far as I could tell, all can be had through any of six filter methods, as espresso or cold brew. The Williamsburg branch is a lovely spot, with an amazing interior. However, the original, housed in a 19th century building and furnished with antiques imported from Paris, goes one (or perhaps two) better. I particularly liked the tin ceiling, which dates from the 1800s. There are plenty of seating options, including a laptop room to the right, comfy chairs to the left, bar-stools at the counter and the Record Room right at back, past the counter. The coffee’s just as good as the interior, Sweetleaf roasting everything in-house and offering the Slap Shot blend (50% Peru, 50% Colombian micro lots) and decaf on espresso, plus the obligatory bulk-brew (no individual hand-pour at the moment). There’s also cake, baked on site. 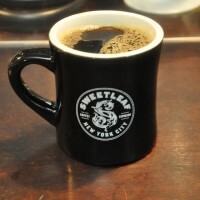 Third Rail Coffee has been part of the New York speciality coffee scene for some time now. A chain of precisely two, this branch, in Greenwich Village, is the original, having opened seven years ago. It’s a small spot, not much bigger than Café Grumpy’s Lower East Side branch where I had started the day, with space inside for maybe 12. The coffee’s from North Carolina’s Counter Culture, the Los Rosales single-origin Colombian on espresso, joined by a guest roaster. This guest spot focuses on East Coast roasters, exemplified by the choice during my visit, Boston’s George Howell. There’s a single-origin (sometimes blend) on bulk-brew, with a choice of four single-origins through the Chemex. These change every couple of months and are chalked up on boards next to the menu. As is often the case in the US, the focus is firmly on the coffee, with cookies if you’re hungry. I recommend walking New York’s High Line to every visitor: that there’s so much excellent coffee along the way, starting with Blue Bottle Coffee at the southern end and continuing with the likes of Intelligentsia in the High Line Hotel, is an added bonus. Into that mix comes today’s Coffee Spot, Underline Coffee, which has been gracing its spot almost directly under the High Line on W20th Street (and across the road from the High Line Hotel) since 2014. 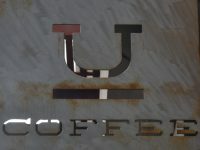 I first visited it in 2016, but failed to write it up for a variety of reasons, not least because shortly after my visit, Underline started roasting its own coffee under the Apes & Peacocks brand, thus rendering me out of date before I’d even put finger to keyboard. So when I finally got back to New York after a two-year absence, I made a return to Underline a top priority. It’s an awesome spot, serving a house-blend on espresso and bulk-brew, with a range of single-origins available as either espresso or pour-over. This is backed up with tea, cakes and a small selection of things on toast, all served in a space that’s a cross between corridor and basement.